– then known as the Gemcees! About March Team Beagle Boys. Below, you get the history of our little marching troupe. It is in English. Other English language posts are collected under this label. Back in 2006, our group of marching buddies decided to call ourselves - wait for it - "The Royal Life Guards Emeritus Marching Company of 2006". And abbreviated it "GEMCEE". Terrible name, but it summed up what we are about: we like to walk and far the most of us have served in The Royal Danish Life Guards Regiment for a number of years. A few are in the reserves, some have quit the Army entirely. But once a Guardsman, always a Guardsman! 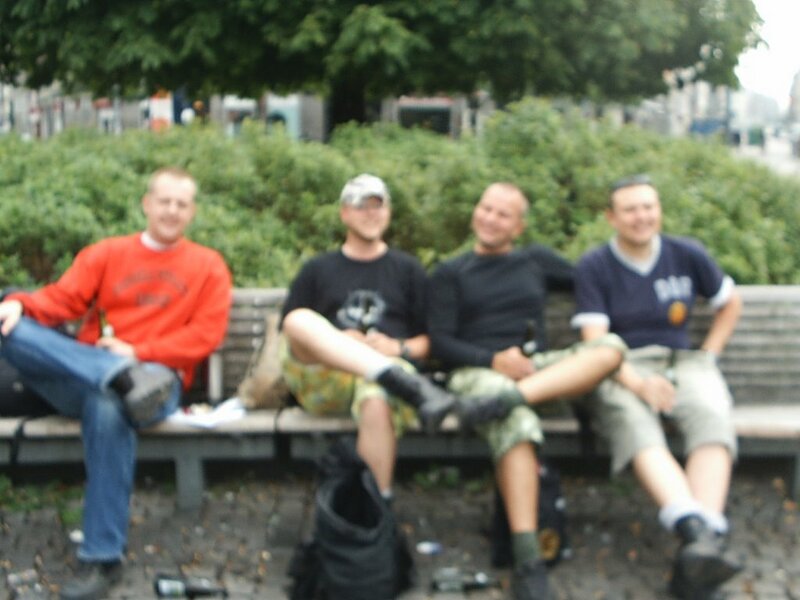 The core of Gemcee were five veterans whom knew each other from the UNMEE mission in Eritrea, Africa, in 2000-2001: Per Ole Fyhn, Morten Bargisen, Robert Krogh Steffensen, Bjørn "BRK" Kærgaard and the editor of this blog, Thorbjørn Hein. The first time we walked together was in the Nijmegen Marches in Holland on the UNMEE team, July 2001. New members have joined the team since. The reason we as a Danish marching team used an English title was because we travel to different countries to walk; one of the best things about marching is that you get to meet a lot of people from all over the world. Apart from that marching is actually quite silly. Really. Take the bus, don't do like us. We're beyond saving, though; for some reason we love to walk a lot of kilometres and thus inflict varying degrees of pain upon ourselves. Read more about Bjørn here. Anyway, in 2011 we changed the name to "Marchteam Bjørnebanden”- that's the Danish name for the Beagle Boys, a Carl Barks creation in the Donald Duck universe. Bjørnebanden translates back to English as the Bear Bandits. Why this change? Because one of our group was called Bjørn, i.e. Bear - an old, Norse name. Bjørn "BRK" Richard Kærgaard Jensen was tragically killed on 30 December 2009, and to honour his memory we now call ourselves Bjørnebanden/the Bear Bandits. That's the reason. The "we're back again!" posting can be found here - but it's in Danish only. A more detailed account of the transformation of the team can be read in our New Years's Eve status of 2011 - and that's in English, and a great article, at that. All articles in English here. The first four years or so of the blog, all the postings were in Danish. English team name or not, we frankly didn't expect that much traffic on the website. This has changed drastically during the second part of 2011, though, with especially yours truly webmaster having travelled to international events other than the Nijmegen Marches. I guess the new acquaintances across Europe have resulted in more readers. A lot of postings are still in Danish, but we will take the liberty of promoting our blog on Pages and Groups on Facebook when we write English language articles. If you want to have a look at the ugly mugs of the Beagle Boys, click here. Also, peruse the other posts up here in the menu bar. We have an open Facebook page, check it out here.